Why is the need so high now? Unfortunately, many clients of the Mission have no fixed address. Whereas during the winter months they may have had friends and family members take them in out of the cold, when temperatures rise those accommodations are less permanent and more tenuous. More people are roughing it. This means that they have nowhere to store extra clothing, and they often lose coats, or have the jackets taken from them by others. This is one of the reasons continuous donations are needed. Streets Alive Mission gratefully accept donations of clothing, shoes, new underwear, etc. at the downtown office, 323 4th St South, Lethbridge. Office hours are Monday to Friday, 9:30am to Noon, and 1pm to 4:30pm (closed for lunch from 12-1pm). Alternatively, people are able to phone the office on (403) 320-1159 and another drop-off time can be arranged. 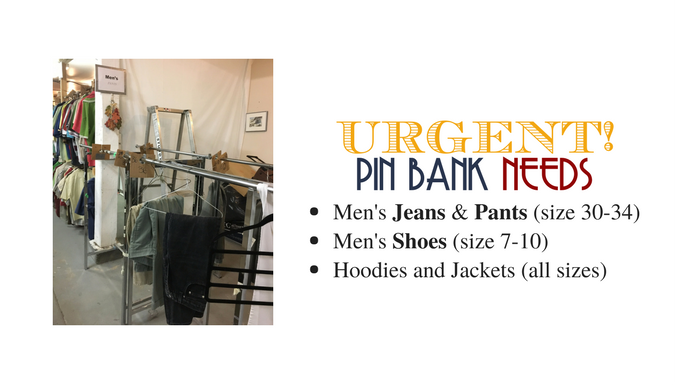 Financial donations are also welcome toward the purchase of underwear or other needed items. Donate online, and look at the Mission Market to select specific needs to support. Your support is greatly appreciated. The need is very real, and every donation makes a difference! Thank you for your generosity!